Selective dorsal rhizotomy (SDR) is used primarily to treat children with lower-extremity spasticity, also known as spastic diplegia or diparesis. The primary goal of SDR is to reduce spasticity and to improve lower-extremity function. Patients who ultimately benefit most from the procedure typically have pure spasticity involving the lower limbs, good cognitive function and strength, no fixed contractures, and postural stability. Cerebral palsy is one of the most common congenital neurological conditions in children, affecting more than 10,000 newborns each year in the United States. Its incidence in 8-year-old children is approximately 3.6 per 1000. Intractable spasticity can cause pain, sleep disorders, increased energy requirements, interference with positioning and difficulty transferring the child, and complications with dressing and body hygiene. Individuals with spasticity often develop contractures and pressure sores that compound treatment. More than 90% of children survive into adulthood if motor and feeding skills are ensured, which rests on the abilities of the individual, as well as caregivers. Among patients with exceptionally poor strength and tone dependence, SDR may not lead to an optimal outcome. The exact anatomical localization of the Ia sensory input to the spinal cord at the dorsal root entry zone by Sindou in 1974 made SDR a more functional possibility. Severance of these specific inputs would allow for loss of tone without concomitant loss of other sensory input or motor control. Normal muscle tone depends on balanced excitatory and inhibitory influences on alpha motor neurons, which are nerves that begin in the spinal cord and travel via peripheral nerves to innervate skeletal muscles. Alpha motor neurons are the principle effectors of motor tone and control. Inhibitory interneurons influence alpha motor neurons within the spinal cord and are activated by cortical upper motor neurons. Excitatory influences come from both muscle spindles and Golgi tendon organs, which are located in the skeletal muscle/tendon, and send information to the spinal cord via afferent sensory fibers of peripheral nerves. Schematic drawings representing the excitatory and inhibitory influences on the spinal cord alpha motor neuron, which innervates the muscle fibers. (A) Normal physiology with a balance of inhibitory influence from descending neurons and excitatory influence from the sensory spinal reflex arc. (B) In children with spasticity, injury to the upper motor neuron results in a decrease in the descending inhibitory influence, leaving a hyperactive spinal cord reflex arc. By cutting some of the dorsal rootlets, selective dorsal rhizotomy can help restore balance to the alpha motor neuron by reducing the amount of excitatory influence on the alpha motor neuron. Courtesy of Tae S Park, MD. SDR is also likely to benefit patients with significant lower-extremity spasticity whose reduction in tone will be helpful in improving function and/or easing the burden of care. 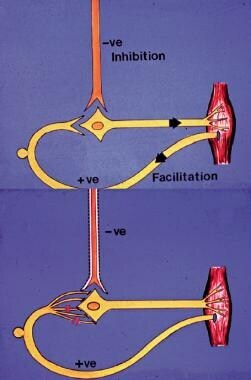 Successful motor tone reduction in SDR and proper surgical technique are based on principles of nerve anatomy with regard to the sensorimotor reflex loop and the anatomic position of sensory and motor roots. Sensory nerve roots contain efferent signals that contribute to the maintenance of motor tone, which is abnormally high in cerebral palsy because of a lack of supraspinal inhibition. Therefore, in order to reduce motor tone without causing motor weakness, only the sensory nerve rootlets (and not motor) must be cut in SDR. The sensory nerve rootlets can be identified by their anatomic position as they exit the canal dorsally and must also be confirmed as sensory nerve using intraoperative electrophysiologic monitoring. Complications of SDR  include sensory changes such as dysesthesias or hyperesthesias, which may be avoided by limiting the number of dorsal rootlets cut. Postoperative urinary retention or sphincter dysfunction may be avoided with intraoperative identification and avoidance of sectioning sacral nerve roots. Postoperative cerebrospinal fluid leak is avoided with water-tight dural closure and overlying fascial closure, as well as dermal closure with a running nylon suture. In a meta-analysis of the 3 randomized clinical trials of SDR, [21, 19] 82 patients younger than 8 years underwent either SDR with physiotherapy or physiotherapy alone. Outcome measures at 9-12 months included lower-extremity spasticity (Ashworth scale) and overall function (Gross Motor Function Measure). Both a statistically significant reduction in spasticity and a greater functional improvement were shown in children undergoing SDR with physiotherapy compared to those who underwent physiotherapy alone. Multivariate analysis also showed a direct correlation between the amount of dorsal root tissue transected and the amount of functional improvement, despite the variability of technique between institutions. Arens LJ, Peacock WJ, Peter J. Selective posterior rhizotomy: a long-term follow-up study. Childs Nerv Syst. 1989 Jun. 5(3):148-52. [Medline]. Kim HS, Steinbok P, Wickenheiser D. Predictors of poor outcome after selective dorsal rhizotomy in treatment of spastic cerebral palsy. Childs Nerv Syst. 2006 Jan. 22(1):60-6. [Medline]. Delgado MR, Hirtz D, Aisen M, Ashwal S, Fehlings DL, et al. Practice parameter: pharmacologic treatment of spasticity in children and adolescents with cerebral palsy (an evidence-based review): report of the Quality Standards Subcommittee of the American Academy of Neurology and the Practice Committee of the Child Neurology Society. Neurology. 2010 Jan 26. 74(4):336-43. [Medline]. [Full Text]. Albright AL. Intrathecal baclofen in cerebral palsy movement disorders. J Child Neurol. 1996 Nov. 11 Suppl 1:S29-35. [Medline]. Foerster. Resection of the Posterior Spinal Nerve-roots in the Treatment of Gastric Crises and Spastic Paralysis. Proc R Soc Med. 1911. 4:226-46. [Medline]. [Full Text]. Foester O. On the indications and results of the excision of posterior spinal nerve roots in men. Surg Gynecol Obstet. May 1913;16:464-474. Fasano VA, Barolat-Romana G, Ivaldi A, Sguazzi A. [Functional posterior radiculotomy, in the treatment of cerebral spasticity. peroperative electric stimulation of posterior roots and its use in the choice of the roots to be sectioned]. Neurochirurgie. 1976. 22(1):23-34. [Medline]. Sindou M, Quoex C, Baleydier C. Fiber organization at the posterior spinal cord-rootlet junction in man. J Comp Neurol. 1974 Jan 1. 153(1):15-26. [Medline]. Peacock WJ, Eastman RW. The neurosurgical management of spasticity. S Afr Med J. 1981 Nov 28. 60(22):849-50. [Medline]. Steinbok P. Selective dorsal rhizotomy for spastic cerebral palsy: a review. Childs Nerv Syst. 2007 Sep. 23(9):981-90. [Medline]. Nicolini-Panisson RD, Tedesco AP, Folle MR, Donadio MVF. SELECTIVE DORSAL RHIZOTOMY IN CEREBRAL PALSY: SELECTION CRITERIA AND POSTOPERATIVE PHYSICAL THERAPY PROTOCOLS. Rev Paul Pediatr. 2018 Jan-Mar. 36 (1):9. [Medline]. [Full Text]. Gutknecht SM, Schwartz MH, Munger ME. Ambulatory children with cerebral palsy do not exhibit unhealthy weight gain following selective dorsal rhizotomy. Dev Med Child Neurol. 2015 Apr 27. [Medline]. Steinbok P, Schrag C. Complications after selective posterior rhizotomy for spasticity in children with cerebral palsy. Pediatr Neurosurg. 1998 Jun. 28(6):300-13. [Medline]. Abbott R. Complications with selective posterior rhizotomy. Pediatr Neurosurg. 1992. 18(1):43-7. [Medline]. McFall J, Stewart C, Kidgell V, Postans N, Jarvis S, Freeman R, et al. Changes in gait which occur before and during the adolescent growth spurt in children treated by selective dorsal rhizotomy. Gait Posture. 2015 Jun 29. [Medline]. Josenby AL, Wagner P, Jarnlo GB, Westbom L, Nordmark E. Functional performance in self-care and mobility after selective dorsal rhizotomy: a 10-year practice-based follow-up study. Dev Med Child Neurol. 2015 Mar. 57 (3):286-93. [Medline]. McLaughlin JF, Bjornson KF, Astley SJ, Graubert C, Hays RM, Roberts TS, et al. Selective dorsal rhizotomy: efficacy and safety in an investigator-masked randomized clinical trial. Dev Med Child Neurol. 1998 Apr. 40(4):220-32. [Medline]. McLaughlin J, Bjornson K, Temkin N, Steinbok P, Wright V, Reiner A, et al. Selective dorsal rhizotomy: meta-analysis of three randomized controlled trials. Dev Med Child Neurol. 2002 Jan. 44(1):17-25. [Medline]. Kan P, Gooch J, Amini A, Ploeger D, Grams B, Oberg W, et al. Surgical treatment of spasticity in children: comparison of selective dorsal rhizotomy and intrathecal baclofen pump implantation. Childs Nerv Syst. 2008 Feb. 24(2):239-43. [Medline]. Steinbok P, Reiner AM, Beauchamp R, Armstrong RW, Cochrane DD, Kestle J. A randomized clinical trial to compare selective posterior rhizotomy plus physiotherapy with physiotherapy alone in children with spastic diplegic cerebral palsy. Dev Med Child Neurol. 1997 Mar. 39(3):178-84. [Medline]. Greene WB, Dietz FR, Goldberg MJ, Gross RH, Miller F, Sussman MD. Rapid progression of hip subluxation in cerebral palsy after selective posterior rhizotomy. J Pediatr Orthop. 1991 Jul-Aug. 11(4):494-7. [Medline]. Mooney JF 3rd, Millis MB. Spinal deformity after selective dorsal rhizotomy in patients with cerebral palsy. Clin Orthop Relat Res. 1999 Jul. 48-52. [Medline]. Ravindra VM, Christensen MT, Onwuzulike K, Smith JT, Halvorson K, Brockmeyer DL, et al. Risk factors for progressive neuromuscular scoliosis requiring posterior spinal fusion after selective dorsal rhizotomy. J Neurosurg Pediatr. 2017 Nov. 20 (5):456-463. [Medline]. Langerak NG, Lamberts RP, Fieggen AG, Peter JC, van der Merwe L, Peacock WJ, et al. A prospective gait analysis study in patients with diplegic cerebral palsy 20 years after selective dorsal rhizotomy. J Neurosurg Pediatr. 2008 Mar. 1(3):180-6. [Medline]. Rumberg F, Bakir MS, Taylor WR, Haberl H, Sarpong A, Sharankou I, et al. The Effects of Selective Dorsal Rhizotomy on Balance and Symmetry of Gait in Children with Cerebral Palsy. PLoS One. 2016. 11 (4):e0152930. [Medline]. [Full Text]. Carroll KL, Moore KR, Stevens PM. Orthopedic procedures after rhizotomy. J Pediatr Orthop. 1998 Jan-Feb. 18(1):69-74. [Medline]. Park TS, Owen JH. Surgical management of spastic diplegia in cerebral palsy. N Engl J Med. 1992 Mar 12. 326(11):745-9. [Medline]. After the conus is clearly identified, a single laminectomyis done entirely with a Midas Rex craniotome. At least 5 mm of thecaudal conus should be exposed. The laminectomy extends laterallyclose to the facet joint. Courtesy of Tae S Park, MD. After the dural incision, an operatingmicroscope is brought into the field. The L-1 and L-2 spinal roots areidentified at the corresponding intervertebral foramina, and the filumterminale in the midline is found. Courtesy of Tae S Park, MD. The L-2 dorsal root and the dorsal rootsmedial to the L-2 root are retracted medially to separate the L2-S2 dorsalroots from the ventral roots. The thin S3-5 spinal roots exiting fromthe conus are identified. A cotton patty is placed over the ventralroots and lower sacral roots. Courtesy of Tae S Park, MD. A 5 mm Silastic sheet is placed underthe L2-S2 dorsal roots, after which the sugeon again inspects the L-2 dorsal root at the foraminal exit, the lateral surface of the conusbetween the dorsal and ventral roots, and the lower sacral roots near the filum terminale. The Inspection ensures placement of only the the L2-S2 dorsal roots on top of the Silastic sheet. Courtesy of Tae S Park, MD. The L-2 dorsal root is easily identified. In an attempt to identify the L3-S2 dorsal roots, all the dorsal roots are spread over the Silastic sheet and grouped into presumed individual dorsal roots. Then the innervation pattern of each dorsal root is examined with electromyographic (EMG) responses to electrical stimulation with a threshold voltage. Courtesy of Tae S Park, MD. With a Scheer needle, each dorsal root is subdivided into three to five rootlet fascicles, which are subjected to EMG testing. Courtesy of Tae S Park, MD. Stimulation of an L-2 rootlet fascicle elicits an unsustained discharge to a train of titanic stimuli. Courtesy of Tae S Park, MD. The rootlet is thus spared from sectioning and placed behind the Silastic sheet. Courtesy of Tae S Park, MD. Stimulation of a rootlet is thus sectioned. Courtesy of Tae S Park, MD. The rootlets spared from sectioning are under the Silastic sheet, and the roots to be tested are on top of the Silastic sheet. Note the EMG testing and sectioning of the dorsal roots are performed caudal to the conus. Courtesy of Tae S Park, MD.